Zen Pinball 2 is an advanced pinball game engine that turns a Mac into an old-time pinball machine. No quarters are required to play, but subtle wrist action and quick fingers will be helpful. Through the use of very realistic ball physics, gameplay seems very natural, without the usual hiccups and delays often seen as complex interactions and events are calculated. 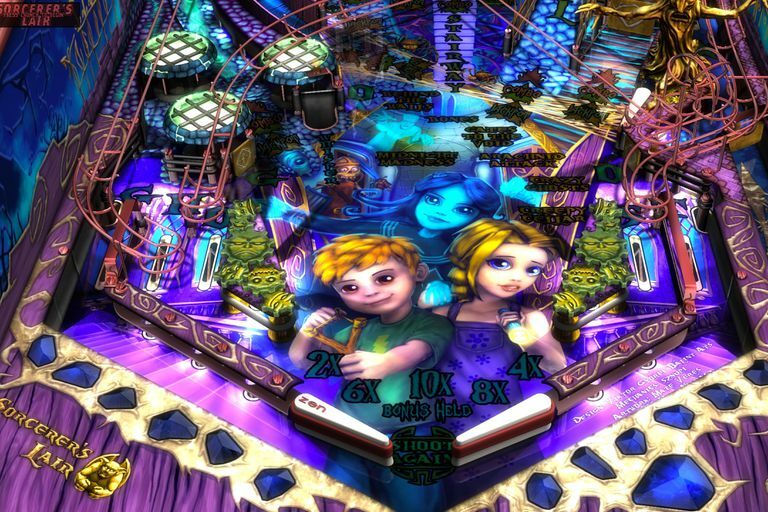 Instead, Zen Pinball 2 produces smooth, natural gameplay that will keep you engrossed for hours. Includes the free Sorcerer’s Lair table. Complex graphics are breathtaking to watch. Table guides available for each pinball table. Menu system for configuring table controls is awkward. Zen Pinball 2 is listed in the Mac App Store as free. Like many free apps, Zen Pinball 2 can be expanded through in-game purchases, but it takes the high road; the Sorcerer's Lair table doesn't require any additional purchases to complete it. This upfront method is refreshing, unlike those that try to hide in-app purchases needed to advance in or finish a so-called "free" game. The free Sorcerer’s Lair table is no slouch; it includes multiple ball ramps, sinkholes, bumpers, remote flippers, ghosts, a scary tree, and the ability to nudge and tilt the table. But even more important, the Sorcerer’s Lair table is no minimalistic, easy-to-play pinball machine. It sets out to show you just how good the pinball physics are in the Zen Pinball engine, and thus entice you to purchase additional tables to play. Once you become the master of the Sorcerer's Lair table, you can add new tables if you like, using the in-app purchase option. New tables currently range from $1.99 to $2.99; you can find information and support, including tricks to achieving high scores and details about each table, at Zen Studio's support site. Zen Pinball launches into a full-screen app, taking over your entire display. The app displays a list of tables you can play or purchase. The Sorcerer’s Lair will be preselected, as it's the only playable table unless you wish to add more. Before diving into playing the free table, I highly recommend reviewing the control setup, available as a button at the bottom of the screen. After you select the Sorcerer’s Lair, you'll be brought to a menu of options for the table, including the single-player game, or the hotshot, a multiplayer game that lets you compete against friends. Zen Pinball can be played in various modes, including just playing as it goes, flipping the flippers and hoping for the best. However, if you bring up the table documentation, you'll discover there are also various skill shots and table missions to try to achieve. Mission occurs automatically when you hit the Mission activation sinkhole. At that point, a mission will become highlighted on the table, and require you to hit the various goals within a set time. Of course, missions aren't just about being a sharp flipper shooter; in many cases, a bit of sorcerer’s magic is used in one form or another to alter how the ball reacts to its surroundings, so pay attention. One of the fun missions is the Arachnid Attack, which takes you to a hidden room; okay, it's actually a hidden table where you must hit all of the spiders guarding the various ramps and objects in the room. I really like having hidden rooms or tables in pinball, so the Arachnid Attack mission was like discovering there was a secret passage no one knew about. The final mission, so to speak, is the Wizard mode, available after you have completed all of the other missions. You start by having to save Whisper, the sometimes-friendly ghost, from the clutches of the sorcerer. You need to send your ball through the ghost, which keeps Whisper from reaching the sorcerer. After saving Whisper, you’re rewarded by three balls being added to the table, which requires you to keep the flippers flipping, and all eyes on the table. Once you complete the wizard mode, the table resets and you can continue to play, piling up the bonuses. Zen Studios takes pride in the visual quality of its pinball tables; each has stunning graphics and absorbing, ​realistic play that will keep you trying to make the special shots that unlock new areas or score higher points. Zen Pinball 2 with the Sorcerer's Lair table is free. Additional tables are available as in-app purchases.